Share the post "EP review: DOWNCAST, BLACK TREE VULTURES"
This five track EP from British band Downcast is an interesting one as on the first listen you just think of the music, then it becomes apparent that the whole thing is one big break up song, or at least that is ho wit tends to come across. The bands punk pop approach is apparent throughout, opening track “Anthurium”, “Window Seat” and “2013” are all good songs., but the acoustic “Sombre” doesn’t really gel with the rest for me and “I’m Sorry” has a more downbeat feel going on. 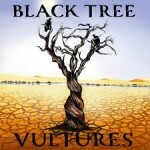 Black Tree Vultures have been together for just under two years yet have the feel of a far more seasoned band, as their new self-titled EP will show, there are only three tracks here but I cannot wait to see what the band can do with a whole album. First track “Bitter” is heavy yet melodic and feels like when Metallica nailed this in the early to mid-90’s (thinking of the couple of albums after the black album here). “No More Empathy” follows in the same vein and “Ode To Johanna” is a riff driven, heavy groove affair that instantly makes you want to hit the repeat button and start again. This entry was posted in All Posts, Single and EP reviews and tagged Black Tree Vultures, Downcast, EP, punk, review, rock. Bookmark the permalink.